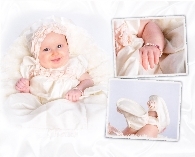 Visit our Baptism Gifts section for a beautiful selection of baby baptism jewelry for both boys and girls! How to correctly measure your wrist. Jewelry care instructions and products. Learn about our FREE shipping & Upgrade options. Questions, comments, suggestions? We'd love to hear from you! Login as an existing customer or create a new account. Link exchange - submit your site! Simple, elegant, petite sterling silver cross earrings. Dainty & Delightful! These beautiful little sterling silver CZ crystal cross earrings on posts, measuring approximately 13mm x 10mm are the perfect gift for girls or teens. Beautiful for Confirmation Day, First Communion or any day! 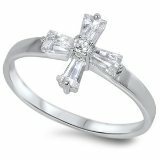 Beautiful sterling silver Crystal Cross Ring to complement any First Communion dress! Also great for flower girls! First Communion Birthstone Necklace - in 12 Swarovski Colors! This adorable little necklace is created with white seed beads and Swarovski birthstone colored crystals, completed with a beautiful crystal baguette cross pendant. So pretty! 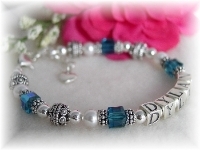 First Communion Birthstone Bracelet - in 12 Swarovski Colors! We're excited to introduce many NEW First Communion jewelry styles and gifts! We know you'll love them! Take a look for yourself! "Like" us on Facebook to receive a special coupon until 04/30/19! Precious baby baptism rosary bracelet created with pink freshwater pearls, Swarovski crystals and a sterling silver cross.��Personalized with sterling silver letter initials. Sometimes it's�hard�to know whether we should accept a difficult situation or try to change it.� May the�Serenity Prayer�Bracelet, based on the well known prayer,�act as a reminder to us to call on God's help in the forms of courage, wisdom and serenity. This beautiful "Pearl Elegance" Mothers Bracelet is created with Swarovski white pearls, birthstone cube crystals and decorative Bali beads.